This 9"x 50" Programmable Tri Color(Red, Yellow, Green) indoor LED sign is an unbelievable value!,You get a very high resolution LED sign at a very reasonable price. Includes: easy to use software, full function remote, and a 9 pin computer connector. 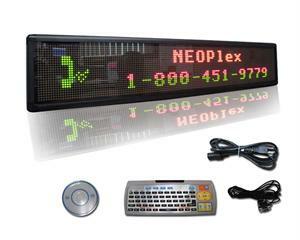 The dot matrix is 5mm, Red, Green, Amber LED and a pitch of 7.65mm, for excellent resolution!